When I was a kid growing up in Los Altos, California, I dug holes in my front yard looking for a lost civilization or a new dinosaur. My friends’ mothers wouldn’t let them play with me after school because they came home with their pockets full of dirt. 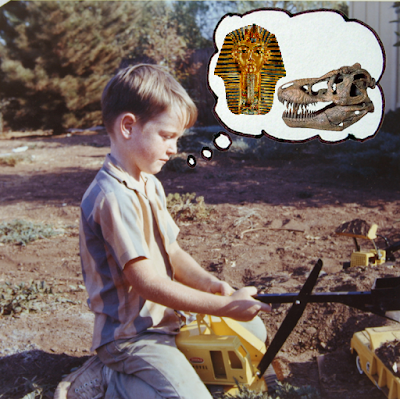 I went on to major in anthropology at UC Berkeley and joined real archaeological and paleo excavations. My childhood dreams came true when I was sent on assignment by National Geographic to travel to dig sites with archaeologists to help them reconstruct life in the ancient world. I used to dig up big dirt clods in the vacant lot down the street so I could shape horse heads with a stick. I grew up to be an equine sculptor. I think the "gene" to create or drift in a certain direction in life begins very early. James, is it you in this picture ?